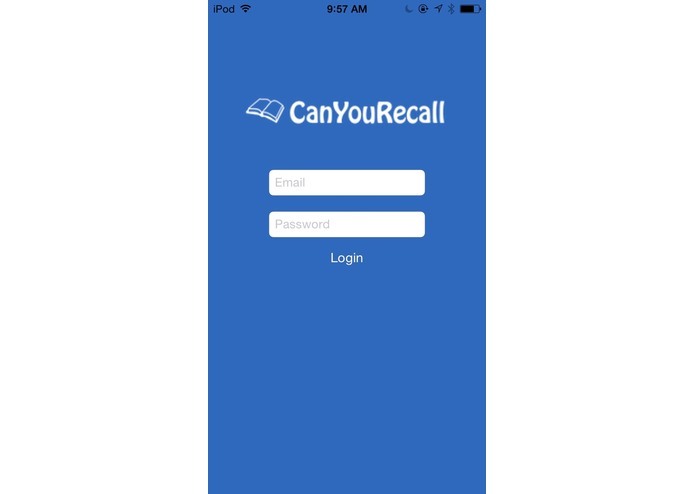 CanYouRecall for the iPhone is a brand-new way for students to study solo and with their peers, anonymously! Our iOS application is based on the core principles of CanYouRecall.com, with some game-changing new functionality and all the convenience of a mobile application. CanYouRecall lets you generate your own questions and quizzes you on what you wrote in the future (of course, you are also able to confirm the answer). By answering your own questions, you are forced to revive the information from your memory which is BY FAR the best way to trick your brain into storing it into long-term memory! We demonstrated that this is effected with a primary research study here at Western University! But what's so special about what we made this weekend? Well, now writing your own questions is only a fraction of the fun. User submissions made through our new iOS app are crowd-sourced and sorted into Western courses. We did not have time to implement data persistency, but once we are plugged into an online database students are just a couple clicks away from accessing all of the questions written by their peers! We used a Tinder-style feedback system for users to interact with the questions in front of them to decide which questions they are confident with, which questions they want to be quizzed on again, and which questions they want to be added to their personal list. Down the road (after we catch up on sleep) we can gather data about the feedback acquired for each question. This will let the app autonomously filter and sort questions by perceived quality! CanYouRecall for the iPhone is going to change the way students study by letting them collaborate with peers in a capacity that has yet to be harnessed! The intuitive, simple, and satisfying UI makes studying more fun, and the question sharing means it has never been easier to learn from each other!